Location: Central Schuyler County, Route 14, about 1.5 miles south of Watkins Glen. A parking area is located on the east side of Route 14, just north of the Village of Montour Falls. 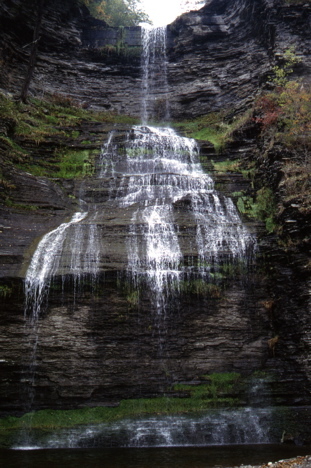 From the parking area on the east side of Route 14, this spectacular 90 foot high waterfall is plainly visible to the west, about 200 feet away. For an up close view of the falls you can cross Route 14 to a small grassy area, but be sure to watch out for the swiftly moving traffic. The creek plunges over the 15 foot wide crest, free falls about 35 feet, and strikes a ledge. It then descends the cliff as very steep cascade, fanning out to about 35 feet in width. The creek then makes a final 20 foot free fall into a pool at the base of the falls. You may be wondering what is upstream of the crest of Aunt Sarah�s Falls. The answer is a series of falls and extremely steep cascades with a total drop of 120 feet. You may also be wondering who Aunt Sarah was. According to one local legend, she was an Indian wife of an early settler to this area, who jumped to her death from the falls. At one time there was a rock carving of an Indian woman�s face near the base of the falls. It was reportedly destroyed by men believing that there was gold hidden behind it. Copyright � 2007 by Scott A. Ensminger.